A vampire (John Carradine) pretends to be the uncle of a beautiful young woman (Melinda Plowman) engaged to Billy the Kid (Chuck Courtney). 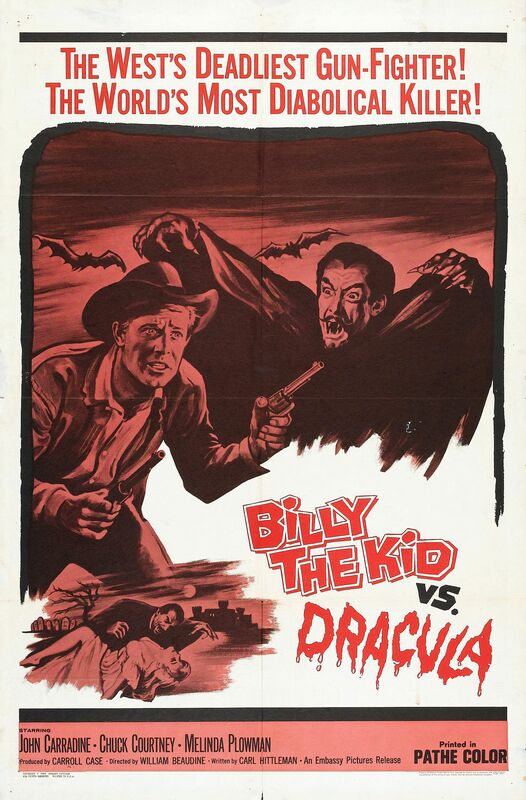 Shot in just eight days in Simi Valley — back-to-back with its “counterpart”, Jesse James Meets Frankenstein’s Daughter (1966) — this infamously awful hybrid horror-western by director William “One Shot” Beaudine is, like its companion piece, based upon a reasonably inspired revisionist concept: what if a famous western outlaw (like Billy the Kid or Jesse James) were brought back to life and given a chance to interact with a notorious horror icon such as Dracula or Dr. Frankenstein? Unfortunately, the concepts behind these two clunkers are the best things about them. In this case, Courtney makes for a disappointingly boring Billy the Kid (who has reformed from his murderous ways), and while Carradine is given a few pieces of choice dialogue to spout — “Where do I find this backwoods female pill slinger?” — he doesn’t quite ham it up enough to make his role all that memorable. Meanwhile, everything else about the production is just sloppy enough to be mildly laughable (n.b. 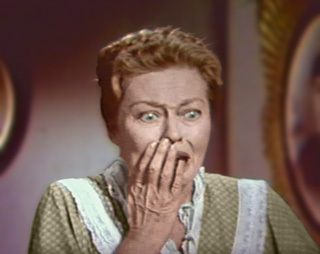 the presence of lackadaisical western music playing in the background while Billy tells Betty [Plowman] the shocking news that her mother has been killed in a stagecoach attack by Indians; the noticeably shoddy attempt to film night-time sequences during the day; Carradine’s transformation into a silly rubber bat on a string) — but not sloppy ENOUGH to categorize it as even close to Ed Wood’s “league” of truly bad films. It does earn additional “sloppy points”, however, for its egregiously lazy attempt to validate Dracula as a viable protagonist in the film: as pointed out by Richard Scheib of the SF, Fantasy, and Horror website, Dracula (who is never named as such in the film, btw — only in the title) is actually “of little consequence to the plot”, given that he could just have easily been conceived as “a conman attempting to steal the land”, and is noticeably “allowed to walk about in daylight”. Yes, simply to have seen at least one of Beaudine’s infamously titled “bad movies” (though either would probably suffice). Listed as a Camp Classic in the back of Peary’s book. First viewing. Somewhat-recommended as a once-must, for its odd place in cinema history. Whereas ‘JJMFD’ is noticeably dull, ‘Billy…’ is, surprisingly, not as bad. It’s just noticeably plain. For a low-budget flick, it’s presentable enough – even if (aside from its premise) it brings absolutely nothing new to the Dracula table; most of its storyline is simply a re-hash of what we’ve seen before. Since it seems that those who worked on the film made an effort to show up for work on-time and apply themselves reasonably well, it’s not a boring film experience. Chances are you will be slightly entertained and able to pass the time with it ok. I was occasionally amused, with just enough interest maintained to see how it all turned out. It’s not saying a whole lot, but the cast here is better than the one for ‘JJMFD’. For some reason, everyone here seems to be paying more attention. (And the script is an improvement over ‘JJMFD’.) Carradine is not the embarrassment he might have been – he just downplays everything, but gets to grow comical bulging eyes when he’s ready to drink. (And he even gets to appear in a red glow a few times; a nice touch.) Courtney (rather cute) and Plowman (rather sweet) come off as an attractive and sympathetic western couple. The added treats here are Marjorie Bennett (perhaps most memorably known as Victor Buono’s mom in ‘What Ever Happened to Baby Jane?’, although she has a long list of credits on IMDb) in the earlier part of the film, and Olive Carey (wife of Harry Carey – Harry Jr. is also on-board here as well – who also has a long filmography, including ‘The Searchers’) as the spunky, no-nonsense wife of the town doctor, who does what she can to be him after he passes on. As he did for ‘JJMFD’, Raoul Kraushaar again adds a score that does help things immensely. And ‘The Mirror Scene’ is done well.